Contact me and describe simply in few words about your idea for a custom macro. I will respond letting you know if the possibility to create your macro can be done, as well if it is within the area of my expertise and is something I am willing and able to take on. Here is a list of what you can expect as well as more information about me. I've participated in the CorelDraw forums (as well many others) for over a decade. I have thousands of posts wherein I've helped users with custom macro work for years, and 99.9% of the work I have done for others was for free! Unfortunately with my current situation, and my family, I am unable to continue to devote my time for free—as much as I do really want to. Every aspect of this website, every page, and every macro within was coded by me. I have a specific area of expertise. So I will respond in a pithy manner. Please don't think I am intentionally being terse or rude. Many who know me personally know this is not the case. If it is something outside the bounds of my expertise, or something that would involve an extensive learning curve therefore negating the benefit to you the client, or myself, I will politely decline the your job. Payments must come up front in full, no exceptions. I am targeting businesses and the fee charged for any and all custom work will pay for itself many times fold over the years. And this is typical. If you are looking for free work, or are on a tight budget, by all means please politely ask in the CorelDraw users forums and perhaps someone who is in a position to donate their time can assist. If I am unable to create your macro I will refund payment. Generally, custom macro work begins at $200 and up. There are exceptions and a broad range of possibilities that can send this rough estimate higher, and in rare cases, lower. Adding feature requests in the middle of a project. If new ideas and features are requested by you, the client, in the middle of a work in progress, this will be considered as an entirely new job, although we can discuss minor improvements and fixes to the work that has been agreed upon. I am flexible, but more unexpected work, other than what was agreed upon—well, time is money, and usually I am very limited in with my time. Expect each macro or feature to start at the base price cost, and will be a new project, even if added to the same macro. One macro can possess literally hundreds of features, ie. internal macros that do a myriad of things. I work quickly. Expect the work to be done within a few days most times. And please be ready and willing to answer questions I have via email during the process. 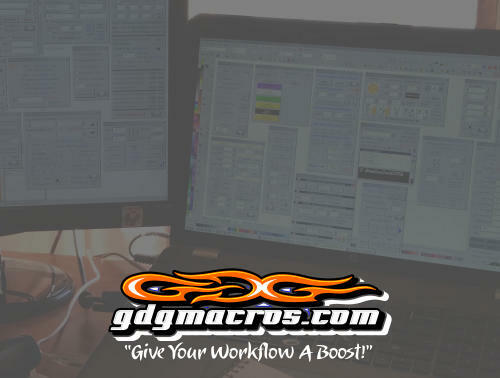 Questions could be simple, such as how do you want the macro form, providing a ready or almost ready macro in the form of a .gms file so that you can test, etc. If you respond in a timely manner, I can get the work done for you faster! Once we finalize our deal you will receive the open source macro file. Future work regarding upgrades, compatibility with new versions of CorelDraw, or adding features will be an entirely new job, involving new cost and approval. I cannot guarantee that I will in fact be in a position to do any more custom work, add new features, or make compatible your macro in the future because something could come up in my life that might stop my ability to take your job a second time, or any other time. I am not always available. I'm curently running several businesses, and together with my wife, raising our four children. I'm also working on my second novel, which I hope to publish this year (2018). Things come up, sometimes life gets in the way, and as always change happens. So, feel free to let me know what you have in mind. I'll read and consider and politely respond by either declining, or accepting to move forward. No response from me? Check you spam or junk mail folder. Rarely my return email can get placed there by mistake. And feel free to ask again. I get many emails daily, and I'm only human, I might have misplaced your message.